We’re now serving fifth and sixth generation families who made such outstanding memories here, they can’t help but want to pass that tradition on. Vic King ignored the naysayers and with support from his wife, Jessica, broke ground on the “Lake George Travel Trailer Park” in 1966. Fifty years later it continues to thrive, with each season seeing a greater demand for reservations – many are returning customers who book their stay well in advance of opening day on the first Friday in May. The park is known in the industry for its signature amenities, including on-site professional entertainment at French Mountain Playhouse, indoor heated pool, designated trolley service to area destinations, paved roadways throughout the park and a two-acre off-leash dog park, Charlie’s Bark Park, that opened in 2014. All amenities are included at no additional cost to the visitor. Continuing in the tradition of adding something new each season, 2016 will see the conversion of three tennis courts to six pickleball courts. Pickleball is a cross between tennis and badminton that’s accessible and fun for all ages. “It allows for an 80-year-old to play against an 8-year-old,” King said. Park guests will also notice 50th Anniversary banners, signage, and commemorative merchandise featuring the tagline “Remembering Vacations” – a nod to the park’s longtime visitors. “We’re now serving fifth and sixth generation families who made such outstanding memories here, they can’t help but want to pass that tradition on,” King said. The Lake George RV Park is an award-winning RV camping resort located in Lake George, NY. The 120+ acre resort offers 400 RV campsites and fully equipped vacation rentals in addition to 30 and 50 amp hookups, water, sanitary, cable TV, WiFi at each campsite, and an extensive list of on-site amenities. 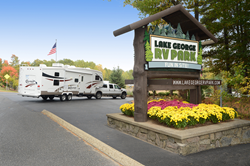 RV camping and lodging reservations can be made either by phone, at 518-792-3775, or online at http://www.lakegeorgervpark.com.